Consumer Drone Market size in 2016 was estimated to be over 2.0 million units with the market value of more than USD 1.5 billion and is anticipated to grow at around 18% CAGR over the forecast timespan. Integration of AI and advanced machine learning algorithm in designing and manufacturing UAVs is a major factor driving the consumer drone market growth. The growing demand from consumers forces manufacturers to continuously focus on technical improvements in the drone equipment. For instance, the integration of collision detection technology and geofencing technology into the UAVs enhances their security features and makes the technology more convenient for operators to fly UAVs for recreational and non-recreational purposes. Moreover, the integration of the technology also aids in complying with aviation authorities, such as FAA and EASA, to restrict the usage of UAVs near national security areas. 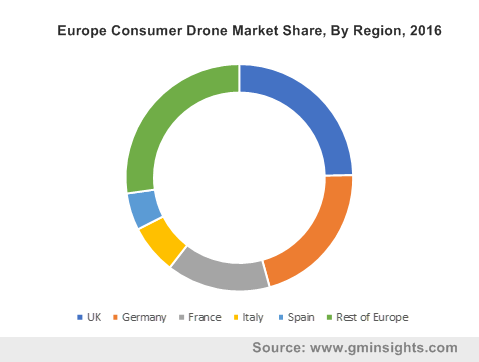 Furthermore, the rising awareness and availability along with the administrative support and initiatives are estimated to augment the consumer drone market growth. In addition, increasing investment activities in China and other developing economies including India and Brazil in the industry also foster the consumer drones market share. However, consumer drones are powered by batteries as compared to military drones that are powered by solar energy. The batteries are expensive, heavy, and need to be charged periodically. This act as major factors that hinder the growth. Furthermore, stringent government regulations and safety issues are also the major factors that hamper the consumer drone market. The rotary blade drone is leading the product market space and the trend is expected to resonate over the forecast timeline owing to its high durability and robustness and its widespread utilization in photography and racing applications. Rotary blade is an ideal choice for aerial photography as they provide better control over position and framing. Furthermore, its ability to carry more weight and better flight control as compared to the fixed wing variant is also estimated to foster the consumer drone market. 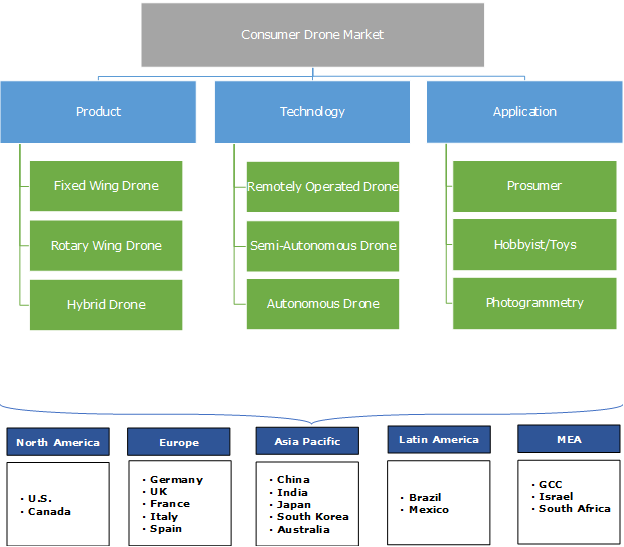 Hybrid UAV market is estimated to grow at a substantial rate owing to the wide adoption for photogrammetry purposes. It comprises features of both rotary blade and fixed wing. Its ability to take off vertically and start flight from any spot as a helicopter are the major factors that will drive the consumer drone market size. Moreover, it provides several benefits over rotary and fixed-wing variants, such as long endurance flight, higher payloads, and durability, which also make it an ideal product for prosumers. The remotely-operated drones are dominating the consumer drone market owing to the stringent rules and regulations among the aviation authorities on the use of UAVs for recreational purposes. They provide conventional features of operating drones through remotes. The restriction on the use of drones beyond the line of sight (BVLOS) is estimated to be a major factor supporting the industry growth. The autonomous drone is estimated to be the fastest growing technology in the consumer drone market during the forecast period. The growth is attributed to the introduction of artificial intelligence and advanced machine learning algorithms in UAVs. Furthermore, their advanced capabilities, such as perform flight, avoid collision, following pre-loaded instructions, following moving objects, store valuable information, and post-flight analysis, are also estimated to fuel their demand. The consumer drone industry is experiencing a significant growth with the rise in interests from prosumer segment, especially hobbyist and enthusiasts. Prosumers are defined as enthusiasts, who buy technologically-advanced products falling under the consumer and professional grade standards in functionality, quality, and complexity. The growth is attributed to the high-end pricing of professional UAVs and below-par recreational drone accessibility in the market. Furthermore, the increasing interest of players in the prosumers segment is also estimated to foster the consumer drone market share. For instance, in May 2017, Parrot launched its new prosumer division called Parrot Professional The new division comprised three new products that focus on agriculture and construction applications with a new work tool and without the requirement of a professional operator. North America is dominating the industry owing to the increasing adoption of the technology for innovative capturing and discovering of events through filming, video, and aerial photography. The relaxation by the U.S.’s Federal Aviation Administration (FAA) on the use of the drone for recreational and non-recreational purposes is also estimated to have a significant impact on the growth of the consumer drone market. Furthermore, increasing investments in the industry and supportive government initiatives are estimated to fuel the market growth. In addition, the presence of a large number of players, such as 3D Robotics, Horizon Hobby, UDI RC, and high disposable incomes of the population are also estimated to be the major factors that will augment the consumer drone market size. China is the market leader in the consumer drone market with the presence of DJI, a Chinese drone manufacturing company and large investments from top venture capitalists being provided from the Chinese companies for recreational and non-recreational applications of drones globally. The country is investing heavily in research and manufacturing with an emphasis on leading innovations in the consumer drone market globally. It is estimated that the country will build the world’s largest consumer drone over the forecast period with a cutting-edge technology and great capabilities to consolidate its market position. The industry is highly competitive owing to the presence of both major players that operate in the other business segment (such as military and commercial) and small organizations that cater to the niche products and solutions of the consumer market space. The market is highly competitive in terms of pricing, product, and functionality. The major vendors of the consumer drone market space are DJI, 3D Robotics, Parrot, Yuneec, Cheerson Hobby, Walkera Technologies, Shenzhen Hubsan Technology, SkyTech, SYMA, UDI RC, Hobbico, Inc., Horizon Hobby, Jianjian Technology, Meijiaxin Innovative Technology, and Mota Group. These players are leveraging on mergers and acquisitions, collaborations, product launches, and investment activities to gain prominence. For instance, in 2017, DJI launched Spark, an easy-to-use, mini camera drone that can be controlled by hand gestures. Consumer UAVs are quite popular and are predominantly used as toys or prototype models. These are designs and developed for recreational purposes and are aimed at consumers for use in places such as beaches and parks for entertainment. Traditionally, UAV was known as a sophisticated military technology and used only for combat operations. However, technological advancements in the technology have developed several new consumer and commercial applications. Furthermore, the decline in the price of the UAVs is also estimated to be one of the major factors that will drive the market growth. The drone industry is still in its infancy; however, there are many companies that are trying to distinguish themselves from the competitors with the help of super stability, handling, and longer flight times.